The only guide with month-by-month advice about caring for your Mid-Atlantic garden. 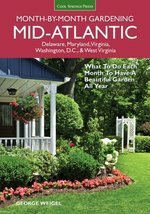 If you liked Mid-Altantic Getting Started Garden Guide, Mid-Atlantic Month-by-Month Gardening should be the next addition to your bookcase! This is the perfect book for beginning to intermediate gardeners and home landscapers living in the Mid-Atlantic (including the states of Virginia, West Virginia, Delaware, Maryland, and Washington, DC). 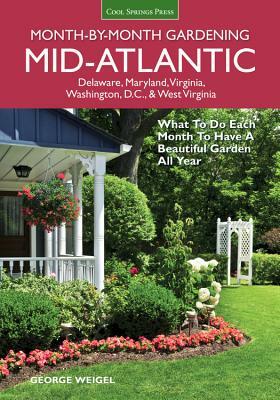 Mid-Atlantic Month-by-Month Gardening gives you the when-to and how-to for growing, caring for, and maintaining your garden and all types of plants. All of the information you need is given in a chronological, straightforward way. From January to December, each month has specific advice on what should be done in your garden. Step-by-step photographs give you the confidence to make your garden as unique as your Mid-Atlantic home. Author George Weigel is a garden writer, designer, and speaker, a Pennsylvania Certified Horticulturist, and--as his balding, plant-killing brother likes to put it-a "Certified Gardening Wacko." He is your guide to the garden, with specific when-to and how-to content to give Mid-Atlantic gardeners the tools to be successful.